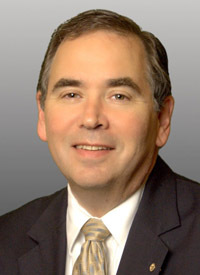 Stephen D. Fantone, recipient of the 2009 Distinguished Alumnus Award from the School of Engineering and Applied Sciences, is widely recognized as a leader in the optics industry. A holder of more than 65 U.S. patents, he has designed optics for a diverse range of commercial and industrial applications ranging from photographic systems and display technologies to medical devices and toys. He has also been an active supporter of the University of Rochester as a fundraiser and valued adviser. "Over the years Steve has been a tremendous asset to the Institute of Optics and to our entire engineering school here at Rochester. He's most deserving of this award," said Robert Clark, dean of the School of Engineering and Applied Sciences. "Steve's insights in the field of engineering, along with his entrepreneurial leadership, will be profoundly valuable as we expand our school and enhance both the undergraduate and graduate student experience." Fantone received his PhD in optics at the University of Rochester in 1979, after completing his undergraduate education in management and electrical engineering at MIT in 1974. He is the president and CEO of the Massachusetts-based Optikos Corporation, a privately held optical engineering consulting and manufacturing firm that he founded in 1982. Optikos is the world's largest manufacturer of equipment for the measurement of optical image quality. In 2008, the U.S. Small Business Administration named Optikos Corp. the Massachusetts Small Business Exporter of the Year. Treasurer of the society and member of the Board of Directors and the Executive Committee from 1996-2013. In 2013, OSA announced it was naming its Distinguished Service Award in his honor. Fantone is a senior lecturer in the Mechanical Engineering Department at MIT, and has also served on the boards of Zygo Corporation, Rofin-Sinar Technologies, Inc., the Pioneer Institute for Public Policy Research, and the Hertz Foundation. As a recognized expert in optical engineering and optical product development, he has served on numerous program review panels, and has provided expert testimony on patent infringement and trade secret litigation cases. Fantone is a charter member of the University's George Eastman Circle, served on the Institute of Optics 75th Anniversary Committee in 2004 and was co-chair of the Biomedical Engineering/Optics Fundraising Committee. He is also a member of the National Council of the College, a group of alumni and other affiliated leaders that was formed in 2008 to advise the University on its current and future directions and is a member of the Hajim School Dean's Advisory Committee. He and his wife, Elizabeth, reside in Lynnfield, MA (Boston area).